UPDATE 9/28/13 – A tip that Adrienne may have been seen near a Mexican restaurant about a mile from the school proved to be correct. “Officers got there, located her, and then we brought her to the police station,” Garland Police Department spokesman Officer Joe Harn told ABC affiliate WFAA-TV in Dallas. Previous story: A Texas girl went missing from her school while she was on her way to a parent-teacher meeting on Thursday. 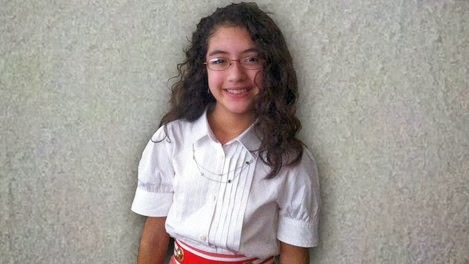 Adrienne Solorzano, 12, a student at the Classical Center at Brandenburg Middle School in Dallas was scheduled to meet her father and one of her teachers during school to talk about her grade in a class. She was given a pass to leave her portable classroom and go to the meeting in the main building, but she never showed up. Cameras around the entrances and exits of the school do not show Adrienne leaving and another camera did not show her entering the main building. There was no camera near the portable classroom. The pass Adrienne was given was found on the ground outside the portable classroom. The school sent a letter to the homes of the pupils so they were aware of the situation on Friday and the police talked to Adrienne’s classmates. If you have any information about Adrienne please call the Garland police at 972-485-4840. OR you can leave anonymous information here.